What girl can resist ordering that extra item when you buy online? I mean, you've already got to pay shipping for one item, why not just throw in that other that you just loved the look of? I was guilty of this when I purchased my first pattern. Twice over, actually, as I believe I bought three patterns at the same time. The first two I have already shared with you: the stays and the Robe a l'Anglaise. The third pattern I purchased was J.P. Ryan's A Fine Collection of 18th Century Jackets for undress wear. It sounded so special with a name like that that I had to have it! 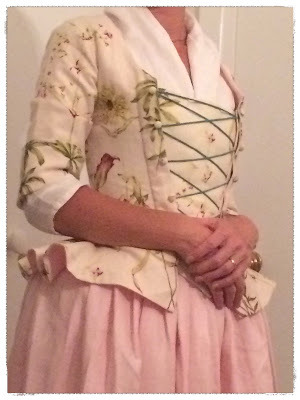 I made View B, which was described: "has a long, full skirt, open front, stomacher and cuffed sleeves, as worn in the 1760s." I will review it on my Pattern Review page. The fitting muslin I made up didn't seem to need many adjustments besides the usual lengthening of the front/side/back by 3.5cm. 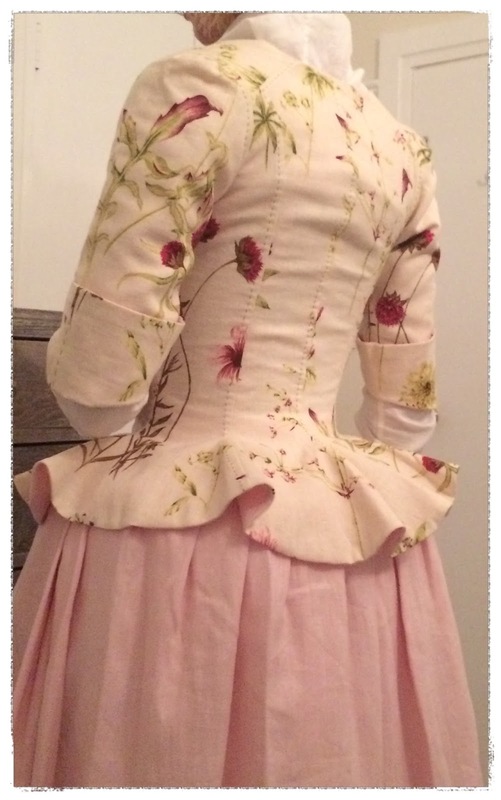 In the end, the fit of the final jacket isn't quite right anyway - almost too snug under arms - and so perhaps I needed to make further adjustments, however perhaps the lack of fit is in fact just how an 18th century garment fits. I have read that a woman's posture at this time was to have shoulder blades virtually touching and that is certainly not how we normally stand these days. Also, sleeves fitted snugly under your arms anyway in the 18th century. These days we have plenty of room for moving as we do, well, move. 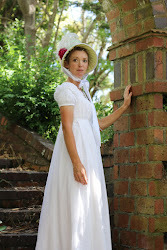 The fit perhaps of a woman's clothing destined for life on a farm or laundry room might have a slightly different cut. In fact, from what I read, many women involved in these active and energetic chores would just strip off their gown and do the work in stays and petticoat. Sounds sensible to me! I had recently made curtains for my living room, a lovely creamy linen in a bright burgundy and green floral pattern. I decided to use this for the main fabric of the jacket, and line it with the left-over pink linen from my English gown. The inside of the burgundy flower on the main fabric is just the same shade of pink as the linen, so my artistic side was quite pleased with the result. I planned to pair it up with the pink linen petticoat that I had made for the English gown, and there's nothing that my eye enjoys more than looking at colours that match! 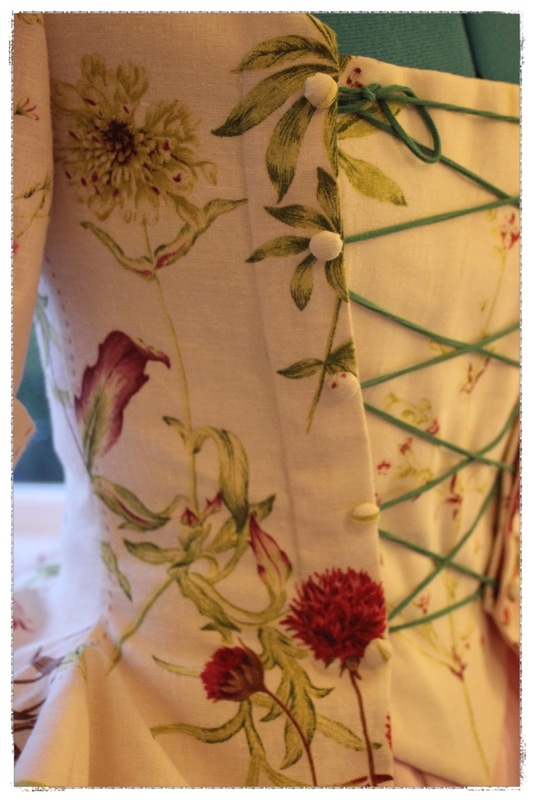 As there were limited off-cuts of the floral linen, I decided to cut the jacket to the shorter basque cutting line, possibly more suitable to the 1770s. However the cuffs certainly date it to the 1750-60s so I will stick that that as my main era. I sewed the pattern up on the machine - as I have mentioned before, when trying a new pattern out I don't intend to waste valuable time and blood on it! The pattern seemed to use mainly modern techniques: the self and lining (including the sleeves) sewn up separately and then the sewn together right sides together and turn right-side out. The wrist seam allowances were turned inside and cuffs were sewn into the sleeve ends. I top-stitched all the vertical seams with a dark burgundy to match the flower on the linen pattern, then purchased some self-cover buttons for the front. 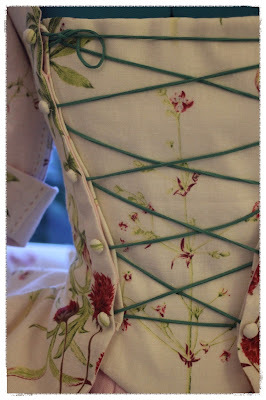 The pattern called for the cord to lace up around the buttons, however I must have got the wrong buttons or something as there was no way that the lacing was going to stay put. Instead, I sewed up two 3 cm strips of linen, boned both sides of the strip and inserted grommets down between them. As this was a 'practice', I hold with the same theory with hand-sewn eyelets as extensive hand sewing! This lacing strip I sewed into the front edges of the jacket and the lacing is inserted between jacket and lacing strips. The buttons are now just for show of course, but it looks smarter. 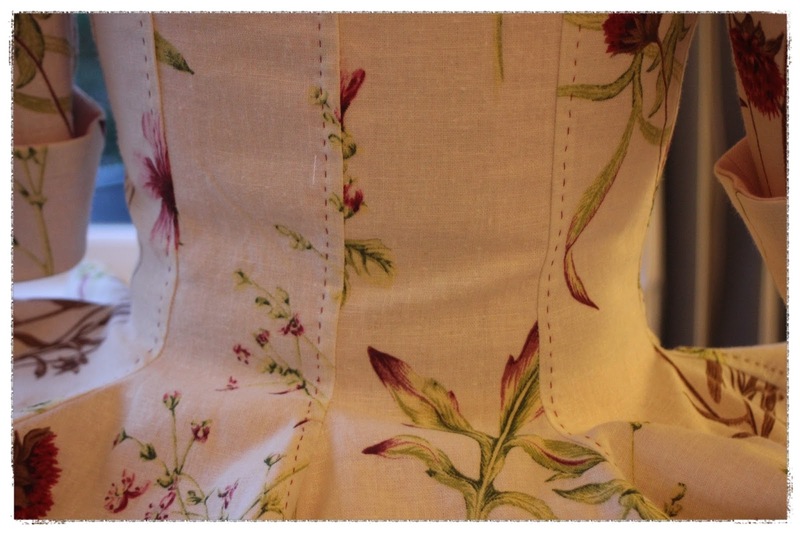 For the stomacher, the pattern designed it to be sewn up using two pieces of interlining, with boning channels sewn into them. The lining and self are then sewn to it and it's flipped right side out. Bones are inserted and it is hand-sewn shut. This leaves it nice and tidy with no visible boning channels. The jacket is nice and smart, with a snug fit, and it looks fabulous with a fichu ticket in. It's not the most comfortable to wear, but possibly that was the fault of my 21st century sense of comfort! It looks very smart with the pink petticoat and a bumroll. I imagine it would suit a woman who is the wife of a store owner or captain of a ship, and she would wear it while out buying from the markets or visiting her sister in the morning.